Welcome to McCann Pediatric Dentistry! 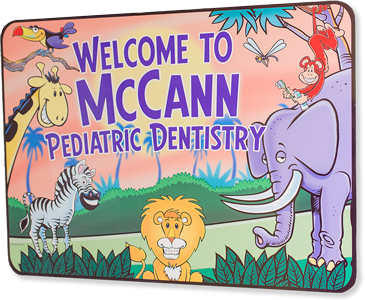 Welcome to the pediatric dental practice of McCann Pediatric Dentistry! Our practice has been caring for children and families of East Memphis, Germantown, and Mid-South communities from Tennessee, Mississippi and Arkansas for over 50 years. As specialists in Pediatric Dentistry, we provide dental care for infants, children, and adolescents in a "child friendly" environment. We emphasize routine preventive dental care, to help each child have a healthy smile that will last a lifetime. Dr. McCann and our experienced staff at McCann Pediatric Dentistry is dedicated to maintaining the highest standard of service and interacting with the children in a compassionate and caring manner. We provide state-of-the-art dental services including: cleanings, exams, fluoride treatments, fillings, crowns, extractions (tooth removal) and guidance for alignment of developing teeth. Guiding the development of your child’s teeth as they grow is a major aspect of what we do. As children grow, one of the most common questions from parents is: What about braces? Some children need braces at an earlier age, some later, and some may not need them at all. Our expertise lies in guiding you in the direction that is best for your child. For most patients, treatment with braces is available and routinely provided in our office. We would love for you to join our family of patients and give us the opportunity to serve, guide, educate and encourage your child while providing dental care at the highest level. Thank you for visiting our website. We hope that you will find it both informative and helpful as you make plans to join our family of patients. 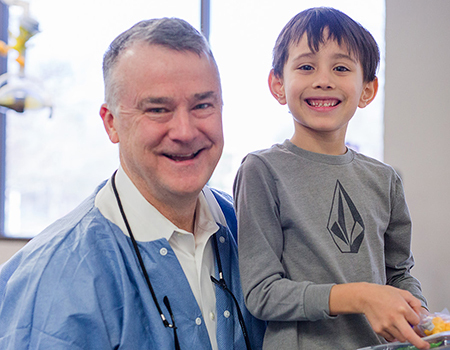 As a board-certified Pediatric Dentist, Dr. McCann is dedicated to maintaining the highest standard of service and interacting with the children in a compassionate and caring manner. Our practice has been serving families of the Mid-South since 1965. We are presently caring for many second generation patients and are excited to welcome our third generation of patients. "Such a sweet practice! Dr. McCann made my boys love the dentist. He explains things extremely well and makes them so comfortable. My 3 year old needed a root canal and it was as if he never had anything done and had zero pain. So pleased and will never see anyone else!" "Very welcoming dental office and the customer service is wonderful. Dr. McCann is very gentle and I love how he personally explains things. This is a very wonderful office." "Our Visit was GREAT!! Great customer service, the doctor was great! He had so much patience with my 2 kids!!! And the wait was not long at all!! Thank you so much! Can't wait for the next visit again." Dr. Billy W. McCann, Jr. is a pediatric dentist in Memphis, TN serving infants, children, teens and children with special needs. The office also serves the surrounding cities of German Town, Collierville and MidSouth, TN. Copyright © 2019 Dr. Billy W. McCann, Jr. and Smile Savvy.